This is a great article by Steven Wedgeworth. Make sure you read the entire thing. It's been a long time since anyone could put together a highlight reel this long for the Tigers. Enjoy! Go here for a Hi Res version. We considered the burden of this text last time: both the Passover history itself and the commemoration of that history in an annual feast. But there is an issue hidden here in this text that has recently surfaced in Reformed and Presbyterian churches and, insofar as we have not considered this question in some time and insofar as it bears quite profoundly on our practice here at Faith Presbyterian Church, and insofar as other PCA congregations do not approve of our practice, I thought I should not pass by this text without taking note of this issue. As you may know, Exodus 12 is one of the key texts in the current debate concerning the participation of covenant children in the Lord’s Supper, the practice known as paedocommunion after its counterpart, paedobaptism. Circumcision was given to covenant infants and so baptism ought to be given to them today. Such is the position called paedobaptism – that is the baptism of children, paedo coming from the Greek word for child – and that is the conviction and practice of our church. We baptize the infant children of believers. Paedobaptism. But for centuries now, indeed from the origin of the Reformed church during the Protestant Reformation, although paedobaptism was practiced and defended as a part of the Bible’s teaching and the church’s practice that has crucial implications for the spiritual welfare of the church’s children, it has been our custom to withhold the Lord’s Supper from covenant children. The thought has been that they should be old enough and intellectually mature enough meaningfully to participate in the sacrament. It is this practice that has led to our dividing the membership of the church – that is the baptized people in our congregations into two groups: the communicants – those who participate in the Lord’s Supper – and the non-communicants – those who do not. In Reformed churches traditionally, including those in which I was born and raised, and, indeed, in this congregation earlier in his history, one did not “join the church,” which is to say, one did not become a communicant member and begin participating in the Lord’s Supper until he or she was 14 years of age or so. It was never a rule that one had to be at least that old, but it was common practice and had been for centuries. Several considerations have recently led a number of men in Reformed and Presbyterian churches to call that longstanding practice of withholding the Lord’s Supper from covenant children into question. I was, some years ago, the chairman of the study committee appointed to consider the new arguments for paedocommunion being offered by Presbyterian Church in America men and I wrote the minority report for that study committee, the report defending paedocommunion. That was some 15 years ago now and at that time the church voted by a large majority to maintain its practice. Through the years since many more men have changed their minds on the question and, I suspect, the vote, if taken today, would be much closer than it was in the late 1980s. In any case, those arguing for paedocommunion, that covenant children should be brought to the Lord’s Table as soon as they are weaned took note of these facts. First, the early church practiced paedocommunion and, so far as the evidence goes, practiced it from the earliest times. Reformed and other paedobaptists have always argued that the evidence for paedobaptism in the early church is a strong argument that paedobaptism was the teaching of the apostles and the practice of the apostolic church. But the early church also practiced paedocommunion. I confess that I didn’t know that – that the early church practiced paedocommunion – until years into my ministry. When I discovered that this was true, it set me to thinking new thoughts. Surely the evidence that the church’s children received the Lord’s Supper in early Christianity serves as a powerful argument that paedocommunion was the teaching of the apostles and the practice of the apostolic church. Indeed, paedocommunion was the general practice of the church until the 12th century, when superstitious ideas about the sacrament – the wine actually becoming the blood of Christ and so on – began to work against the full participation of anybody but priests in the sacrament. The children lost the Supper when everyone else lost it; they just didn’t get it back at the Reformation. Now, in the interests of fairness, I should tell you that some have tried to argue that the evidence for paedocommunion as a widespread practice in early Christianity is inconclusive, but it is important to point out that almost all opponents of the practice both during the Reformation era and in our own day have admitted that it was the practice of the early church. That, obviously, is something to consider. Second, the argument against paedocommunion at the time of the Reformation was very superficial. In fact, if you go looking to see why the Reformers did not restore the Table to covenant children, you will be disappointed at how little effort was made to defend this decision. Almost no one was clamoring for children to participate in the Lord’s Supper and the Reformers had any number of other pressing issues to deal with. It is not surprising, really, that you can’t find more than a page here or there devoted to the question. To my knowledge, and I and others have looked hard for it, there is not a single book devoted to the question pro or con until our own day. In many great works of Christian theology, even in many books on the Lord’s Supper, there is no mention of the question and no defense of the practice of excluding covenant children. It was a custom so completely accepted that hardly anyone ever gave it a thought. I don’t remember the matter ever coming up in a seminary class or ever coming across an argument in favor of paedocommunion until I was well into my ministry. It was a custom carried over from the medieval church with little or no reflection and became a habit in the Reformed churches, so much a habit that it was not thought necessary to provide a justification for it. Third, when an argument was provided, it was almost always solely a reference to 1 Cor. 11:28 and to Paul’s requirement that people examine themselves before partaking of the Lord’s Supper. In the mind of the church the argument reduced to this simple syllogism: people should examine themselves before coming to the Supper; little children cannot examine themselves; therefore little children should not take the Lord’s Supper. If you find an argument against paedocommunion in a work of Reformed theology – you usually don’t, but if you do – it will be this argument and almost never anything else. I confess that I knew that that was the argument for our practice and it satisfied me, until I thought about it for the first time. The only time we ever had to haul that argument out and deploy it, in any event, was when Baptists accused us of inconsistency. Baptists have always argued that if we baptized babies we should give them the Supper too and we replied – very weakly I now think – that the reason we didn’t do this was that there was this additional requirement that Paul laid down for participation in the Lord’s Supper. The problem with the appeal to 1 Cor. 11:28 is three-fold and, in my judgment, each of these three objections by itself is enough to render Paul’s statement about self-examination irrelevant to the question of paedocommunion. Watch the trailer for Ben Stein's up-coming movie "Expelled!" Watch the entire thing; it's worth it. Islam denigrates women. The Christian faith glorifies women. The evidence is everywhere to see. But perhaps the most despicable example of this is the practice of female circumcision. The reason this is done is to reduce and/or prevent sexual pleasure. This is not "circumcision" at all. To call it that makes one think that it somehow related to the Jewish practice or the medical procedure so many of us are familiar with. It's nothing like that. It's the barbaric mutilation of female genitalia in the name of Allah. It's designed to prevent women from experiencing sexual pleasure. Supposedly, this promotes proper Islamic piety. There's a photo spread on this in the New York Times Magazine. The featured clinic is in Indonesia, but this mutilation is perpetrated on women in Middle Eastern and North African Muslim nations. I don't know the origin of that phrase, but it accurately describes me since Friday afternoon. I haven't been this ill for years. There's a new blog in town. It's the official Biblical Horizons Blog. There are a number of contributors. I'm just one of them. We just set this up, so it may take some time to heat up. I plan to use my blog for more personal, fun posts. I'll probably post most of my amazing, incredible biblical theological insights on the BH Blog. Oh well, let's hope the other guys post a lot. 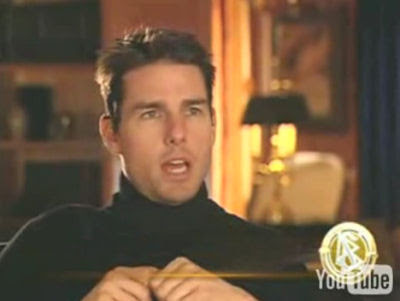 Someone posted this Scientology training video of an interview with Tom Cruise on YouTube, but the Scientologists got it yanked for copyright reasons. I can't embed it, so you'll have to go to the Defamer site to see it. Well, you need to watch it and listen to this weirdo pontificate. Just feel the KSW, man. What a nutcase. Elegant, gorgeous, eminently useful, and a HUGE TEMPTATION! Thin women don't really move me, but this. . . oh baby! Here's my big question: how sturdy is it? It's so dang thin that I keep picturing myself letting it slip out of my hands onto the tile floor. Will it shatter? I want to know. Hopefully, someone will make a rubberized sleeve for it. Watch Steve Jobs do his magic. What I love about this particular clip is the response of the guy who's making the video when Jobs takes it out of the envelope. It's like. . . well, you know. What a hoot! People who take themselves too seriously should not be trusted. Besides, they're not very fun to be around. Far from being evidence of hubris, mocking one's self and whatever "movement" one might be associated with is quite healthy. I began this chapter with a discussion of characteristic mentality and suggested that a psychological society creates a climate of unrelenting seriousness. If approached from another direction, the question of characteristic mentality becomes the question of what characters are missing from the story. I cannot prove statistically what I am about to say; you will have to check it against your own observations. However, my observation is that in the modern theater of life, not on is the set—tradition, ritual, family—discarded but the cast of characters has been narrowed down alarmingly. The present atmosphere does not allow much room for spirited eccentricity, for that larger-than-life character represented in literature by Sir John Falstaff or Samuel Pickwick and in reality by a man like Samuel Johnson—men, in short, who live their lives with outrageous exuberance. When we think of these characters, we think fondly; they are like overgrown children. It never occurs to them that growing older means growing more serious about oneself. Johnson, even in his later years, delighted in rolling downhill. Pickwick and Falstaff, likewise, spent their days tumbling from one merry episode to the next. What all three have in common is the capacity to give pleasure by their company and conversation. The reason is their levity. Beneath the service vanities, they take themselves lightly. Giving pleasure of the kind they give depends on a basic humility, a recognition that they are but men among men, not special selves on the high road to fulfillment. It is hard for lightheartedness to hold the stage, though, once we learn how very seriously we ought to take ourselves. And this is what psychology has taught us. One casualty of our over-seriousness may be our sense of humor. And that is because all humor involves a loss of dignity. The man who makes a face to amuse a baby gives up his dignity; so does the man who roars with laughter. The essential condition for having fun is to forget your dignity, that is, to forget yourself. After a while, Amy looked up and saw Brian standing awkwardly forty feet away, with Nickie on a leash. Clearly, he wasn't sure that giving her time to herself was the right thing, but of course it was. Michael Cogland [however] had been always self-assured and smooth and confident in any context. But what had seemed to be a natural grace had been in fact the sociopathic gloss of a man who had never been inhibited by so much as a scintilla of humility. I'm on vacation this week. Actually, I'm working on and off on a couple of lectures on liturgical reform that I will be delivering next week. But I'm mostly just relaxing. Not much to blog this week or next. Last night I picked up my oldest daughter from the airport. After working hard over the holidays she was able to get a week off. Her Christmas present to me was The Texas Hill Country Cookbook: A Taste of Provence . The author Scott Cohen is the executive chef at Las Canarias at Omni La Mansion del Rio where Becky is the Pastry Sous Chef for both the Omni La Mansion and the Watermark Hotel & Spa on the river walk in San Antonio. Interestingly enough, we just received the issue of Travel + Leisure that lists the 500 top hotels in the world. The Watermark is on the list, and it's the numer 2 spa in the USA. And Becky's picture is in the book! 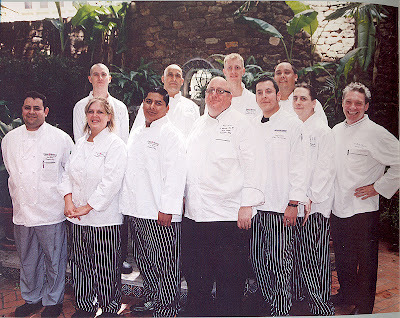 The chapter "The Chef's Pantry" has a large picture of the staff. Here it is. Becky is the only girl in the photo so you can't miss her.